As the nation gets ready to elect its Leaders , we're launching the #VoteRight campaign on Saturday 8th December,2018 coming together with one voice to hold aspiring leaders to account. With DJs, conversation with political candidates,speakers,Panelists, comedy,special appearance of FalztheBahdguy, Miss united Nation ,spoken word, All youth forums on the plateau and hundreds of young VOV members, it's going to be a launch event to remember. 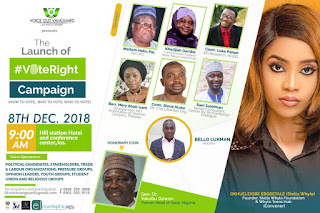 It's in Jos,Plateau state on Saturday 8th December,2018 (hill station hotel ), kicking off at 9am.